You are here: Home / Uncategorized / Client Blog – Pre Race, Bournemouth Festival of Running. Client Blog – Pre Race, Bournemouth Festival of Running. My first Half Marathon. Will it be my last? I’m 55 years old and have in the past played football and rugby, tennis and badminton. I’ve been a Tae Kwon Do black belt instructor. I’ve tried judo, karate, kickboxing, Thai-boxing and ju-jitsu. I am a member of a road cycling club and I ’ve taken part in triathlons, both sprint and Olympic distance. I even race an Alfa Romeo in the Historic Sports Car Club series. I’ve always thought that it’s the journey not the destination but perhaps this year I was just drifting. I started the year thinking, like most years, I need to lose some weight and get fitter. I didn’t really have a specific reason in mind, just that nagging feeling that it wouldn’t be long before I had to sit down to put my socks on. I’ve been a member of Fitness First for about 10 years and I have been through phases of regular attendance and phases of trying to avoid eye contact with their staff when I’ve walked down the street to get lunch. I had started a diet after Christmas and commenced a cycling and circuits regime of sorts in February but wasn’t really motivated. I’d even tried a few sessions on the punch bag to rekindle that martial arts buzz. While working with the punch bag a new Instructor came over and started to talk to me about martial arts and that changed things. The instructor was Allie Park and she had just decided to make fitness training her new career having been a research biochemist. Allie is also a kickboxing black belt who likes ironman competitions. We got on from day one. We agreed that we would do some martial arts together for fun and she would think about how to help me with my fitness goals once I decided what they should be. Now I felt motivated to stick at the diet and to train hard, as hard as I had done for years. Between April and June I lost 10kg and was now at my lightest for over 20 years. 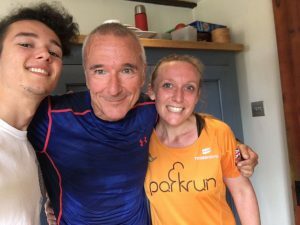 Allie had been chatting to me about what I’d like to have as goals for the year and we had started to talk about seeing if I could run further than 10km at a reasonable pace but we’d not got into it seriously. For me 10km had always seemed like such a long way. I like to run with music and over the past months I have been reintroduced to the music of Bruce Springsteen by a serious fan of his. We discussed what would be a good playlist to run to and as usual I listened to suggestions and then went off and decided for myself. On a busy weekend in early June, Samantha my eldest daughter, came to visit on her way home to Bournemouth having visited my mother up in Hull. Samantha is a keen runner and also enjoys lots of different exercise routines and we chatted that afternoon about what we were both doing. Samantha casually asked me if I had considered running any longer distances and before my brain had engaged I found myself saying “…we’ve talked about a half marathon” which Samantha immediately jumped on suggesting that we do the Bournemouth half marathon together in October. The die was cast. Now I needed to be serious about training. I explained what I had done to Allie the following week and she quickly put together a training program with the October event as the goal. She explained that I should reduce the cycling element and focus on running. And over the next 3 months I had a weekly plan that I followed very closely. On occasion I’ve done a bit more than planned and its been carefully pointed out that the plan is there for a reason and should be considered gospel. She’s tough. My weekly training plans had been a mix of building up to longer runs and shorter interval based sessions and gym work. One weekend the plan said “Park Run”. I’d not come across this before but after a short amount of internet research discovered that this is a friendly 5km Saturday morning run with others. I decided I would do the one in Bedford after dropping my youngest son, Dylan, at school. My best 5km time in the past had been around 28 minutes and I’d timed myself earlier this year at a rather disappointing 31 minutes. However I was feeling stronger and fitter and wanted to see how I would do. I was nervous about setting off too quickly so I put myself at the back of the 350 starters that June morning. The start was a bit of a bun fight but pretty soon I was picking up the pace and overtaking other runners. After the second km I was running at around 5 minute 15 second pace for a kilometre which I found unbelievable so I slowed down a bit for about 500m, but I felt strong so I picked up the pace again. The next kilometer was also around 5 mins 15 seconds and I still felt good. With a bit of a sprint at the end I managed a frankly incredible 25 minutes. I was so excited I sent texts to pretty much everyone I knew and thought might possibly be interested. By complete coincidence Samantha had been doing a Park Run in Poole that morning and had posted a very similar time. In fact I was so incredulous about that time that on the next occasion I was able to do one I was nervous about whether I could run at that pace, perhaps there had been a mistake. But I managed another personal best at 24 minutes. On 3rd September Samantha had come up to see her Dylan playing at Caufurd Arms with The Basilisk as support for Diamond Head. As this was the first time we had had together since agreeing to the half marathon and I had a long run on the plan we decided to run together. It was a fantastic hour and a half. We were able to keep pace with each other pretty well. I had the advantage that I knew the route and could pace myself accordingly and it was a great experience. Perhaps I really could run the race with my daughter all the way, something I hadn’t dared to think seriously to that point. Over these weeks I’ve run in Bedfordshire, Hertfordshire, Cambridgeshire, Warwickshire, Switzerland, Germany, Italy, Greece, and India. 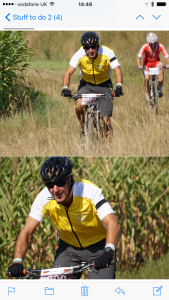 The only real deviation from running was a brief excursion into the area of off road cycling. 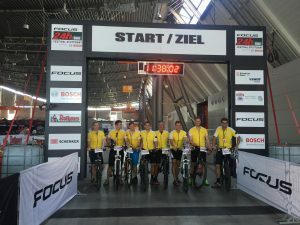 I had been invited by my colleagues at Messe Stuttgart to be part of an 8 person mountain bike team and participate in a 24 hour race through and around Messe Stuttgart. I only managed to get in one reasonable training ride and then arrived in Stuttgart for the weekend of the event. It was great fun and the team of riders and the amazing support team made me feel so welcome and I thoroughly enjoyed it. As a team we would complete two or three laps each, hand over to the next team member and then collapse. During the race we completed 68 laps of the 7.5km circuit and were around 2/3rd of the way down the list of 8 person teams. We were all quite pleased with that. But to put it in context, the winner of the solo riders did 70 laps. Amazing. A half marathon is 21.1km, more than twice the distance I had ever run before, and I was concerned that I would not be mentally able to put in that level of sustained effort but a couple of relatively slow 18-19km lunchtime runs had reassured me. But with only a week to go the anxiety returned. What if I picked up an injury, what if I went too quickly at the beginning and then couldn’t finish, what if I went too slowly at the beginning and couldn’t put in a respectable time? I started to worry that I was still carrying too much weight, I have kept around 75kg over the past months, or that I wouldn’t have enough energy stored to run the distance so perhaps I should eat more. I was getting tense.